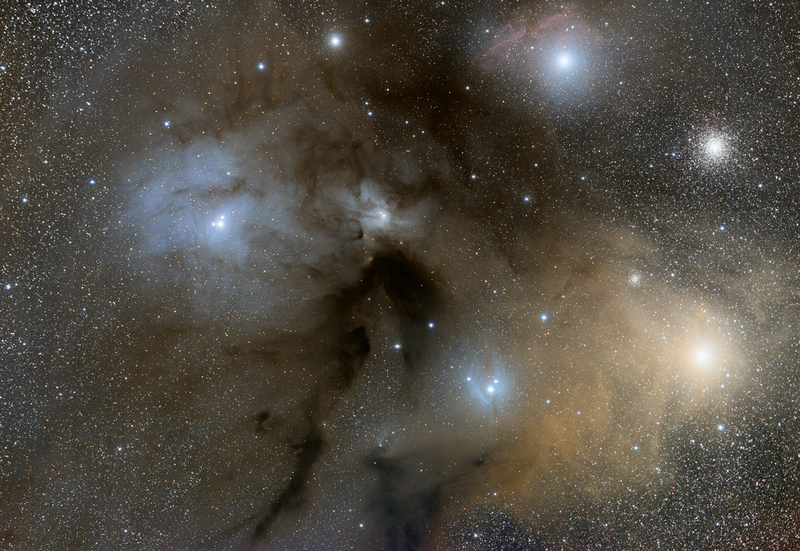 The Rho Ophiuchi cloud complex is a dark nebula of gas and dust that is located 1° south of the star ρ Ophiuchi of the constellation Ophiuchus. At an estimated distance of 131 ± 3 parsecs, this cloud is one of the closest star-forming regions to the Solar System. This cloud covers an angular area of 4.5° × 6.5° on the celestial sphere. It consists of two major regions of dense gas and dust. The first contains a star-forming cloud (L1688) and two filaments (L1709 and L1755), while the second has a star-forming region (L1689) and a filament (L1712–L1729). These filaments extend up to 10–17.5 parsecs in length and can be as narrow as 0.24 parsecs in width. Some of the structures within the complex appear to be the result of a shock front passing through the clouds from the direction of the neighboring Sco OB2 association. Temperatures of the clouds range from 13–22 K, and there is a total of about 3,000 times the mass of the Sun in material. Over half of the mass of the complex is concentrated around the L1688 cloud, and this is the most active star-forming region. Many difficults with this object: a) lights taken at variable weather conditions, so only a few frames could be used; b) spacer for Tak reducer was wrong, so oval stars at the corners can be seen; c) object very low on horizon and d) gradients created by street illumination on some color images.